Atelier Caito for Herve Pierre gown in colorblock silk crepe. Cascading detail on skirt front. In early September 2017, Caito drummed up the idea of creating a capsule collection - the novelty behind the label Atelier Caito for Herve Pierre was actually simple.Both Caito and Herve Pierre leveraged the natural relationship between the designer and the pattern maker, knowing this connection is the key ingredient to making the perfect dress. 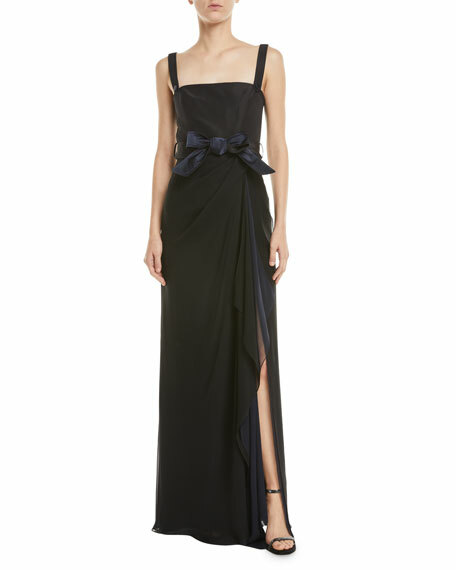 Badgley Mischka crepe gown with beaded appliques. Square neckline; V back. Spaghetti straps; draped cap sleeves. Slim silhouette. Short back train. Hidden back zip. Polyester/polyurethane. Lining, silk/spandex. Made inn USA of Japanese material. Exclusively ours. 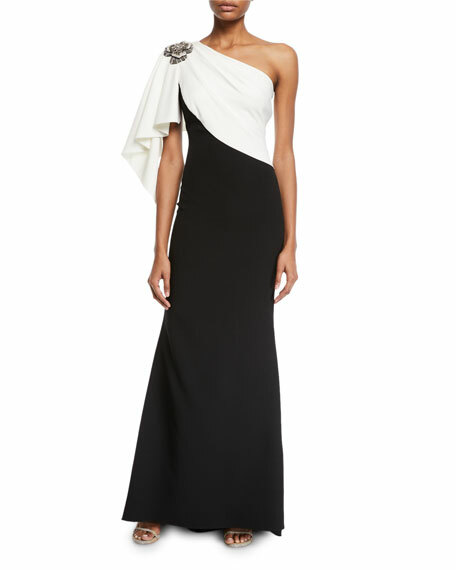 Badgley Mischka Collection gown with layered sleeves. Off-the-shoulder sweetheart neckline. Short bow sleeves. Ruched bodice. Mermaid silhouette. Floor-length hem. Train at back. Hidden back zip. Polyester. Imported. Exclusively ours. 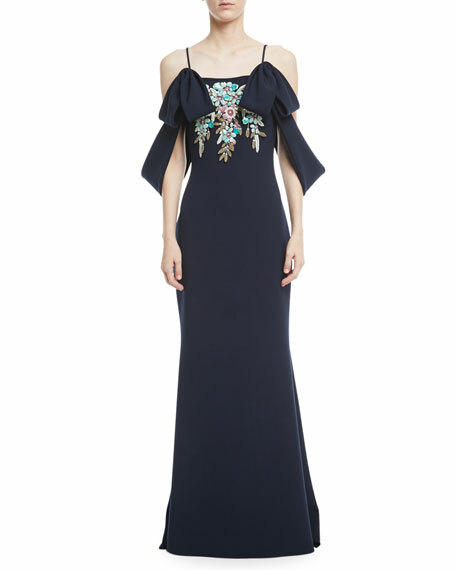 Badgley Mischka gown with BG exclusive shoulder brooch. One shoulder neckline. Cascading, short sleeve. Draped georgette bodice. Butter crepe skirt. Fluted silhouette. Fishtail back. Polyester/spandex. Combo, silk/spandex. Lining, spandex/polyester. Made in USA of imported material.